In part.1, we talked about how to build a flexible template that will allow you to forecast your cash flow. Before you go working on this template, you probably have a business plan that describes the market you are targeting, and your capabilities in acquiring a certain market share. The business plan also probably describes your expectations of the economy in the few coming years. 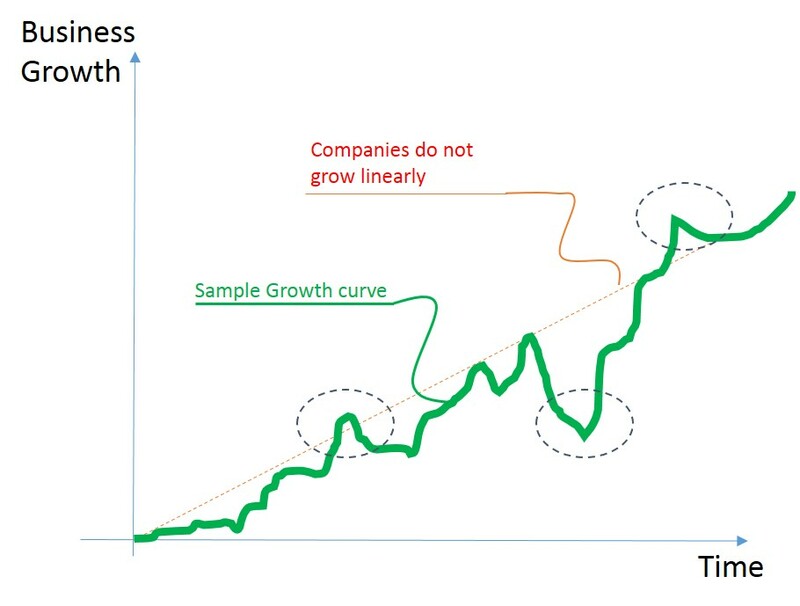 We all know that, no business grows linearly, because markets and economics do not do . … right ?!!! Financial crises in 2008 caused a major economic recession worldwide especially in USA, and Europe. Revolutions and the political instability in the middle east affected the market there and a lot of surrounding and dependent markets. Any price move in oil causes a lot of sequences in the whole world. A natural disaster in the far east can affect computer components prices worldwide!. Less estimate your competitors capabilities. Wrong estimate the consumer behavior. New competitors can get into the market. Major change in the market (technology drift for example) … see what happened to Nokia after iPhone and android get into the market. When you present your project to an investor, he might dig into these details. You should expect that, and be able to discuss it. Expect the worst. Read about the Black Swan effect. When you first start with the template, start working on the optimum plan. 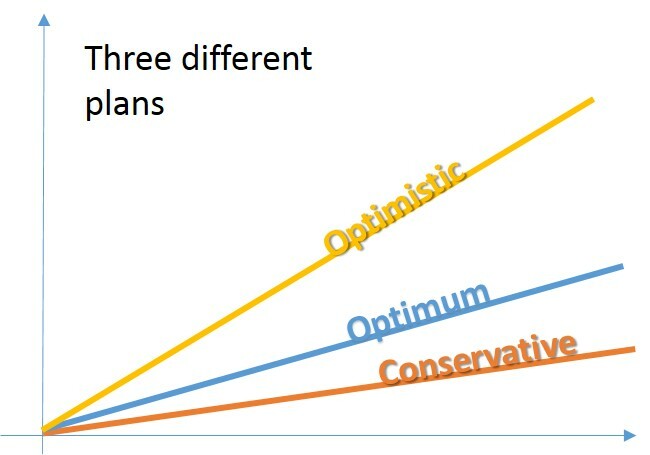 Optimum plan is the plan based on the current given assumptions for the Economy and business risks. If numbers are working good with this plan, you have a chance to convince an investor, and if not, i encourage you to stop and rethink of your idea. And see what it takes to enhance your numbers. Please read about “lean start-ups“. Then go plan for the Conservative case, where you over estimate risks, and plan even for things that are unlikely to occur. If you have a good idea, then this plan will show how much your business is immune for economical disasters. Finally go plan for the optimistic case, where you show what would happen to numbers if things go better than our expectations. Also another reason for having three plans is that in a good business, things starts slow and then accelerate. As an example, I work in the Cloud business domain. In a good cloud business, revenues grow exponentially, as shown in the figure. So when i made my three scenarios (Conservative, Optimum, and Optimistic) financial plans for the project i am working on, the three scenarios was not only to show how much the business is immune and promising at the same time, it was also to simulate three different periods. The 1st period where revenues are growing very very slowly. The investment will be used to cover expenses in this period. The 2nd period where revenues are growing good. The 3rd period where revenues are booming. The conservative plan, will be the plan that needs the biggest investment, because the period where you need cash to cover your expenses will increase. So you have to think in which plan you going to ask for investment. when you move between the different scenarios, do not alter the revenues only, think also about the expenses. It is logically that when sales figures are doing good, is that you spend more in marketing. when you finish your plans, please draw the following graphs so you can feel how your business is going to perform. 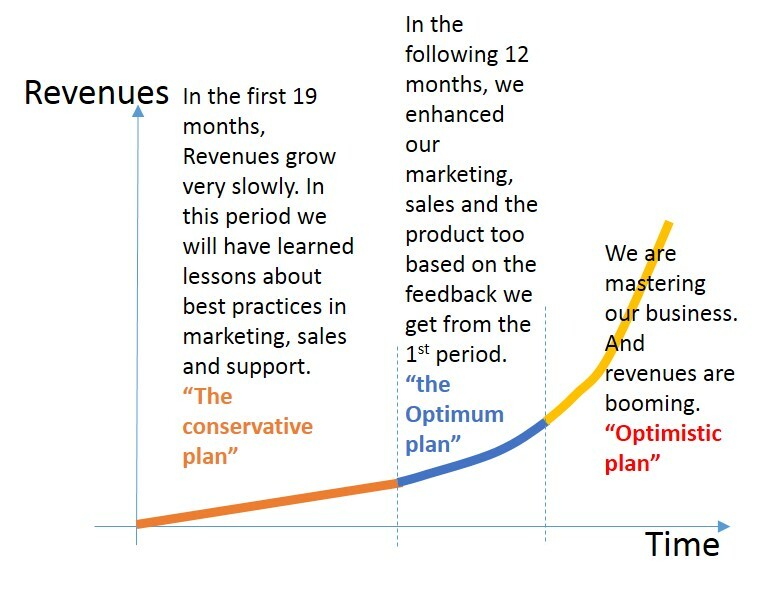 comparison between the three different plan revenues. Revenue – Expenses (which is almost the gross profit). Accumulated cash (which is the net profit, that can be distributed to share holders). Now go do it yourself and feel the numbers….